After checking approximately 19,000 traps statewide, and about 3,000 specifically in the north Portland area, the Oregon Department of Agriculture is happy to report no detections of Asian gypsy moth following an 8,800 acre eradication project this spring. The good results indicate there will be no need for ODA to come back next year with additional treatment for the invasive, plant-eating pest. Last year, ODA found 14 gypsy moths statewide, five in the greater Portland area. Two of the moths were trapped in or near Portland’s Forest Park, another two in the St. Johns area and the Port of Portland’s Terminal 6. The most significant was the detection of Asian gypsy moth– one in Forest Park, the other near St. Johns. Additionally, an Asian gypsy moth was trapped across the Columbia River near the Port of Vancouver in Washington. Trapping results appear to show that three aerial applications of the biological insecticide Bacillus thuringiensis var. 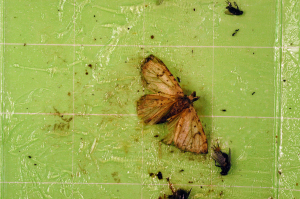 kurstaki (Btk) not only eradicated an existing population of gypsy moths in the area, but that there are no new introductions of the exotic insect this year. “It looks like the pest pressure from Asia has decreased and inspections by US Customs and Border Protection and USDA-APHIS (Animal Plant Health Inspection Service) of vessels coming into from infested areas of Asia have been effective,” says Burfitt. Oregon is more familiar with the European gypsy moth, which is usually introduced when new residents or travelers from areas of high gypsy moth populations in the eastern US unwittingly bring the pest with them on outdoor household furniture or other items that may harbor gypsy moth eggs. Asian gypsy moth is potentially a much more dangerous insect. 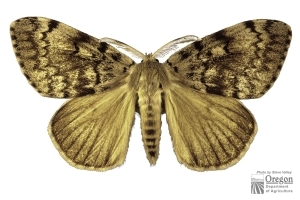 Unlike its European cousin, the female Asian gypsy moth has the ability to fly, which can lead to a more rapid infestation and subsequent spread. The Asian gypsy moth also has a larger appetite for what grows in Oregon, including a taste for conifers. There have been just three Asian gypsy moths detected in Oregon prior to last year– a single catch in North Portland in 1991, one caught in Portland’s Forest Park in 2000, and one caught in St. Helens in 2006. It’s notable that two of the three Asian gypsy moths trapped in Oregon were relatively in the same locations as the 2015 detections. It’s not surprising since infested cargo from Asia runs the risk of coming into Portland via ship along the Columbia River. Reports that Asian gypsy moth populations in the Pacific Rim are down is welcome news to Oregon and Washington– two states that conducted large eradication projects this past spring. Oregon’s neighbor to the north caught 10 Asian gypsy moths last year. This year’s scorecard is not perfect, but close to it. There were six European gypsy moths trapped in Oregon over the summer– 4 in the Grants Pass area and 2 east of Springfield in Lane County. Neither locations are being considered for an eradication project next spring, even though gypsy moth detections in Grants Pass have taken place for the past couple of years. Next spring, additional high density trapping will take place in areas where gypsy moth was detected this year, along with the heavy trapping in north Portland. 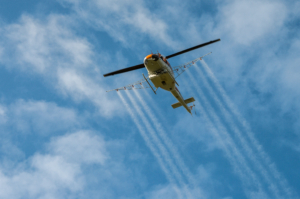 Since new introductions of gypsy moth– both Asian and European varieties– can occur any year, Oregon is probably never going to be out of the woods when it comes to the threat of the invader. That’s why it’s so important to put up the traps. Early detection allows for a rapid response in the form of treatment to eradicate gypsy moth populations. All the outreach efforts prior to spraying in the Portland area this spring were well worth it, says Burfitt. With no plans for gypsy moth eradication in 2017, Oregon can return to a quieter spring. For more information, contact Clint Burfitt at (503) 986-4663.